Premium natural cat food plus vitamins, minerals & other nutrients. Satisfy their nature. Real salmon 1st ingredient. Grain free. Satisfy their nature. Break, peel, serve. Calorie Content (Calculated) ME: 1833 kcal/kg, 39 kcal/serving. 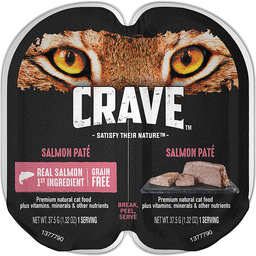 Crave Salmon Pate Cat Food is formulated to meet the nutritional levels established by the AAFCO Cat Food Nutrient Profiles for maintenance. Questions or comments? 1-800-255-4738.